Meet the Leahys- all eight of them! 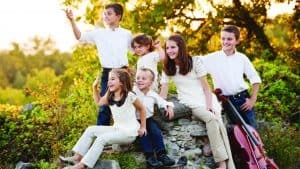 Doug, Jennifer and their kids bring high energy, infectious, Celtic-based music that audiences have come to associate with the Leahy heritage. Trust us, these kids will enamor you with talent beyond their years. Experience a family that is indeed for real and that is also dead set on sharing the joy of music with you, at The Dunn Center.